Are you planning on laying tile on your concrete basement floors? You’ll find that this is a great way to spruce up your basement and increase the lifespan of your concrete floors. To add tile to your basement, you’ll need to follow several steps. 1. Check for damages to your basement floor. You want to search around for cracks, leaks, rough areas and any other anomalies before you begin the installation of your tile. These damages should first be repaired, otherwise it could cause uneven surfaces. 2. Clean your basement floors. You should remove all debris and dust using a broom and vacuum cleaner. Whatever is left can be removed using a mop, water and bleach. 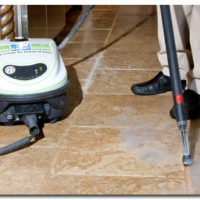 All areas should be cleaned, so that the dust doesn’t hinder your tiling job. 3. Prepare your tile for installation. Once you have found the pattern you want, cut the tiles to the desired size using a nipper. Mark your floors, creating quadrant divisions using vertical and horizontal lines, after the tile has dry-set. This will be your guide for applying the tile. Remove the pieces of tile and prepare to apply thin-set mortar. 4. Apply the thin-set mortar. You should read the instructions that are on the label, since each manufacturer is different. Apply it one quadrant at a time to the concrete, using a trowel’s flat side. 5. Lay down the tile. 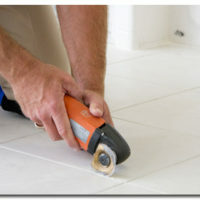 Secure the tile into the correct locations, using a rubber mallet. To create a barrier for the grout, use spacers. Allow the mortar to dry afterward. 6. Apply the grout and allow to dry. Follow the manufacturer instructions for mixing the grout. Remove the spacers and apply the grout in its place. Once it settles, use a soft cloth to remove the excess grout. Wait up to 48 hours to allow the grout to cure. In the basement, the kitchen, or anywhere else in the home, a tile floor can provide lasting beauty and protection. For any type of maintenance on a tile or grout surface, contact a local location of The Grout Medic . We handle all of your tile and grout cleaning and restoration needs. For the best basement finishing in Denver, contact Elevation Basements. They’ll help you find the perfect flooring and furnishing options to turn your basement into a special place in your home.